My apples were really juicy too. Maybe I should have drained them like you suggested. Fun to look at past recipes. I didn't have a cake plate to put this on, so I flipped it out on a parchment lined sheet pan. 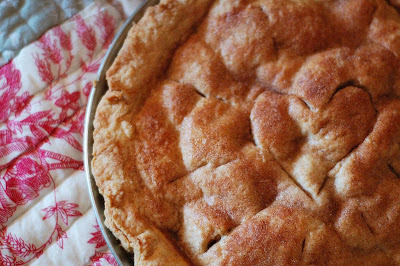 Great post and your tart looks delish! My daughter-in-law is a vegetarian and I made her a spinach pie using puff pastry, cottage cheese, parmesan cheese, spinach, egg and onion. We all (non-vegetarians alike) loved it! Love the TWD redux! This is my first week baking with the group, so nice to see what's been baked already. I caramelized my apples till they were really dark and that reduced the volume of caramel by a lot. No spillage when flipping! But you're right--how can you go wrong with butter et al? Mmm! I'd pick pie over cake anyday, too! Love your photos. Having a giveaway today on my blog. Hm.... draining the apples. Great idea! I'll have to try that next time - glad the floor wasn't ruined. It came out beautifully! Your tarte tatin turned out great! So pretty. I love your list of favorites too. and can second the dish that Meghan is talking about. Ina's Orzo with Roasted Veggies is fabulous. I have made it multiple times. If you need more ideas I could send you a couple more links. Let me know! ooh bummer about the apple juice running all over the floor. At least it tasted good! 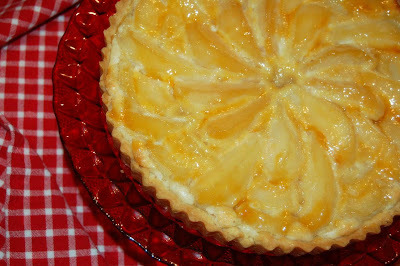 :) We adored the french pear tart at our house too! I wish I would have tried the tarte. I have been a vegetarian for longer than I care to count. A couple of suggestions: vegetable/spinach lasagna or vegetable pot pie. Both are great for having people over because you are finished with the hands on part long before the guests arrive. Or fancy up your own vegetarian night and do cheese enchiladas. Your tarte tatin looks great to me. Also, I love your favorite TWD rewinds. Happy New Year. Love your tarte! I had to make this one too, what with the connotations of France and Dorie. And I really enjoyed your TWD hit parade! Not sure how formal your dinner is Friday night but we LOVE Ina's sun-dried tomato goat cheese tarts (on puff pastry) and the individual pizzas. But check out Rebecca (Ezra Pound Cake). She's been posting veggie recipes on Mondays. Fun post - loved the look back at all of the TWD favorites! I really wanted to make the tarte but didn't have the right pan so maybe another time. It really does look fabulous! The tarte looks just fine to me. It was so easy and so tasty. Love apples, too. It looks nice! I was surprised how juicy the apples were when I started cooking them. I had to cook a lot to get the juice down and the color dark. The French Pear tart is one of my favorites, and I'd like to make the brioche raisin snails. I had a vegetarian over for dinner recently and I made Ina Garten's White Pizzas with Arugula (recipe is on the Food Network site). They were a hit! One tip: watch them closely. The parchment started to burn in the hot oven and I had to slide them off to finish baking. I also recently posted a recipe for spinach lasagna (plugging myself there!). What a magnificent post! It made me so hungry. Wonderful work. Oh, those brioche snails look amazing! My tart didn't turn out so great, so I'm dying to give it another try. Yum! All of those desserts you talked about have everyone licking their lips! Nice job on the tarte tatin. Wow! Everything looks amazing. But the pear tart looks to DIE FOR! Despite your mishap, that tartin looks great and makes me hungry.